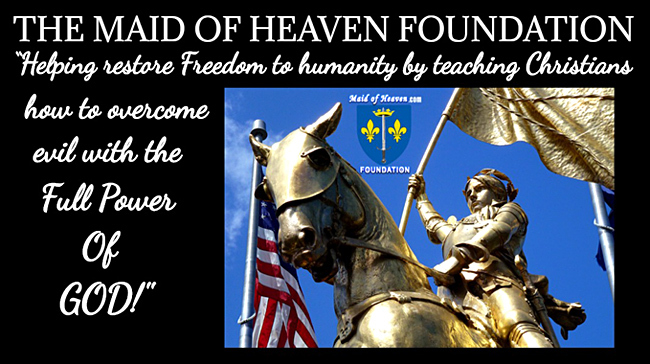 Maid of Heaven Foundation - Overcome Evil With The Full Power of God! With The Full Power Of God! 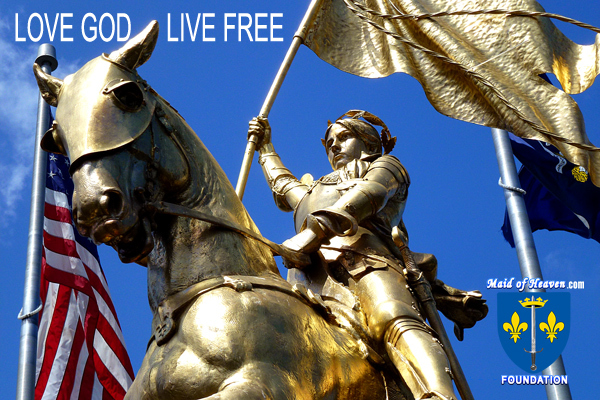 The story of Saint Joan of Arc’s life has been hailed as “the wonder tale of the ages” for good reason because all that she was able to accomplish is truly unparalleled in the history of the world. Only seventeen years old when she took command of the army of France she is the youngest person to ever hold supreme command of the army of a nation. Within only a few months of taking command she won one of the great turning point battles in all of history and just a month later she won one of the most overwhelming victories in all of history. Her brilliant successes on the battlefield saved her country from being enslaved by a foreign invader and made her a hero forever to her country and to everyone who loves God and freedom. While some people still struggle to explain in worldly terms how she could accomplish so much what Saint Joan of Arc’s life really shows so dramatically to our world is what a Christian can achieve when they possess the full power of God. Having faith in God is what is absolutely essential to being able to overcome evil with the power of God. And it only takes a very little genuine faith because a mustard seed was the tiniest seed known to anyone when Jesus walked the earth. On the other hand lack of faith is what keeps God from being able to perform “mighty works” as shown by the people in the very hometown of Jesus. When Jesus went back to Nazareth He tried to teach the people there God’s truth from the scriptures but they did not believe in Him and “He did not do many mighty works there because of their unbelief.” (Matthew 13:58) When people do not truly believe in God then it greatly limits what He is able to do so we must do all that we possibly can to strengthen our faith in Him. Fortunately for us Jesus also gave His disciples some indication during the whole discussion concerning the demon possessed boy about what can help us to have the faith necessary to be able to do “all things.” The Apostles Matthew and Mark both recorded Jesus further telling His disciples: “This kind [of demon] can only be driven out by prayer and fasting.” (Matthew 17:21 & Mark 9:29) In telling His disciples this Jesus was revealing how important having a deep relationship with God is for being able to overcome evil because prayer and fasting are such essential parts of truly knowing God intimately and being in union with His will. It is therefore extremely important for Christians today to understand that to be able to do anything of consequence for God requires having a deep relationship with Him which is only possible through spiritual disciplines like prayer and fasting. Saint Joan of Arc is far from being the only saint of God to have performed miraculous feats during their life and the Apostle Paul makes a point of showing exactly how much Christians can accomplish with faith in Hebrews 11. Paul lists some of the great Christian heroes like Moses, Joseph, David, Samson along with many others and tells us how they “through faith conquered kingdoms, administered justice, and gained what was promised; who shut the mouths of lions, quenched the fury of the flames, and escaped the edge of the sword; whose weakness was turned to strength; and who became powerful in battle and routed foreign armies.”(Hebrews 11:32) Paul’s whole discourse in Hebrews 11 makes it overwhelmingly clear that Christians can accomplish “all things,” just as Jesus promised, when we have the same kind of faith that all the great Christian heroes possessed. It is high time for all Christians today to start living their lives with the full power of God and become forces for good in this dark and evil infested world. Even if we fear we still do not have the faith necessary to do “all things” after doing all that we can to be close to God we need only remember one other great lesson from the story of Jesus healing the demon possessed boy because what the boy’s father said to Jesus is what we all need to say to God: “Lord, I believe; help my unbelief!”(Mark 9:24) And once we truly have the faith of Christian heroes like Saint Joan of Arc then we will unleash God’s full power in our lives and be able to overcome any and all evil that we will ever face which will contribute greatly to restoring freedom to all of our lost humanity! May God Bless us all with the faith to do exactly this!